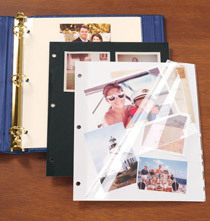 Get more photo enjoyment from a single album with this Presidential extra capacity personalized photo album. 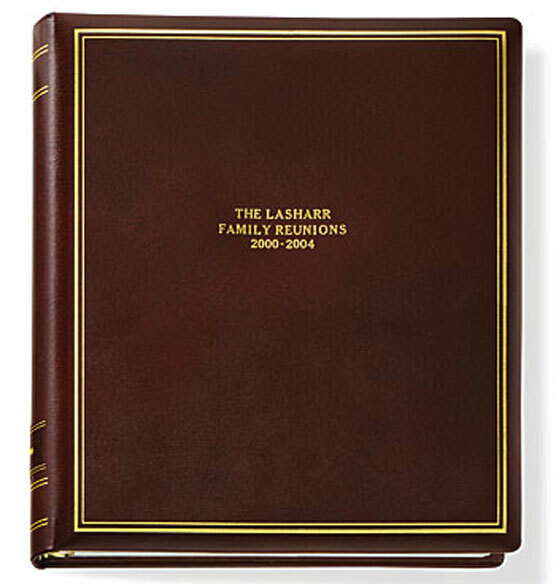 It may soon become your favorite photo album, thanks to all the great features, including a luxurious antiqued cover crafted of quality top-grain leather. 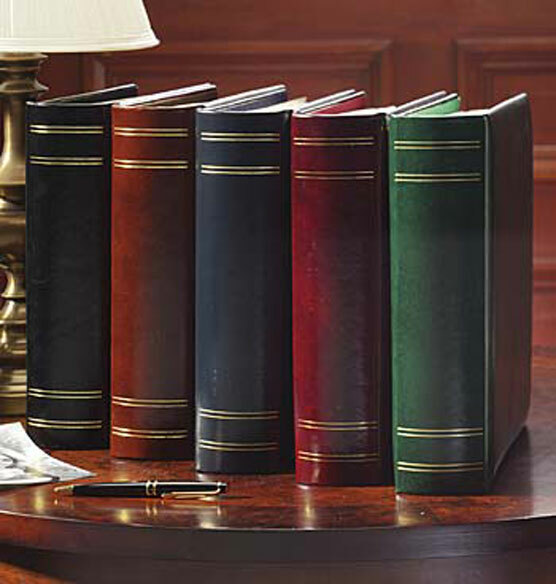 The richness of the leather, and its book-like appearance make it ideal for bookshelf or coffee table display. Gold borders and spine accents add to its luxurious appeal. When opened, the inside cover is lined in color-matching moirè for visual consistency. 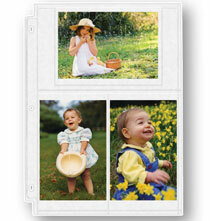 With extra capacity, you can focus on creating bountiful photo collections in a single album. 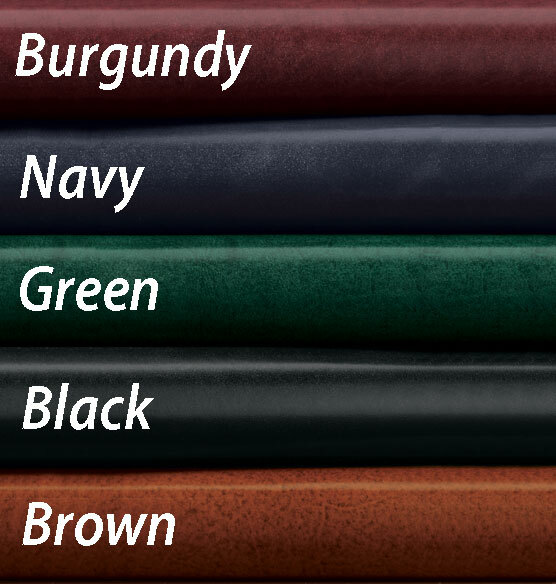 Choose rich colors of burgundy, navy, green, black or brown. I think the Presidential albums are great. High quality...really like heirlooms. I have been buying them for a decade. I like the large capacity for special topic albums. A winner. This album worked perfect for holding my genealogy papers. It's well made and should hold up for years to come. Very nice! year. The albums have become family heirlooms. During the past several years, I've been replacing all my old albums of various sizes, qualities, and colors with these Presidential albums. Aside from the hassle of having to move each picture from old, not very well-made albums to Presidential albums, these albums have been perfect. I've personalized each so I can find quickly the correct album when I'm looking for a specific picture. I like the look and feel of the albums, the heavy construction and the size. I"m using this album to organize my family's lineage. Good to display photos but I wish the brown was darker. Do not waste your money--within a few years, this album, which I spent quite a bit of money on by filling it with Exposures' oversize pages, has a cracked spine at both the top and the bottom of the album. Even though Exposures claims that they want their products to last "a lifetime" and for as long as your memories - "forever" - they will not replace this album bc they have a 45 day return policy & can't find my info in their computer system. If you end up buying this, don't say I didn't try to warn you. If it fell apart on me, after taking exceptional care of it & storing it with my other albums, it will fall apart on you too. This is my sixth purchase of this album! I use these albums to store our memories of month long trips around the world. I usually am able to mount 800 photos along with little memorabilia. the shelf and enjoy a trip all over again, and again and again. It looked beautiful in the photo, and I hope it will when it arrives. As a retirement tribute for my husband. Loved the look, very impressive. I have purchased about 15 of these albums over the years. They are well made and worth the extra money. like the album and capacity. BEST ANSWER: Thank you for your question. The spine measures 3" W x 11 1/2" H. We hope this information will be of help to you. What Is the size of the pages? BEST ANSWER: Thank you for your question. 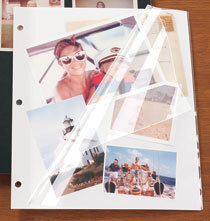 Any of our 3 ring photo pages will fit in this album. They are sold separately. We hope this information will be of help to you. looking for a nice album with personalization for my son to keep his award certificates in....not sure if this is the correct size? BEST ANSWER: Thank you for your question. This album is 12" wide by 11 1/2" high. 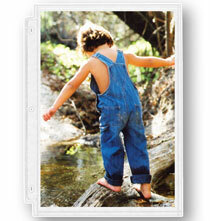 All our extra capacity albums have a 2" ring. We hope this information will be of help to you. Very nice if he has a lot of certificates, it’s a very thick album. Can the spine be personalized? BEST ANSWER: Thank you for your question. Yes we do carry the matching spine patch the number is 309857. We hope this information will be of help to you. It's a leather adhesive patch. If you plan on purchasing more than one album, I highly recommend personalizing the spine. Is it possible to emboss a logo on the cover as well? BEST ANSWER: Thank you for your question. Unfortunately no, we do not emboss logos. We hope this information will be of help to you. BEST ANSWER: Thank you for your question. Please join our email list to see all of our current sale prices. We hope this information will be of help to you. how long for personalization to arrive? BEST ANSWER: Thank you for your question. Personalized items take 6-10 business days to arrive. We hope this information will be of help to you.